Barred windows, i.e. windows with separation bars or dividers, are amongst the oldest known forms of window design. Today, however, they serve a different purpose to former times. Before glass was discovered as a transparent means of filling the window opening, people used to use animal skins or linen. Only the material glass offered another perspective when it came to providing windows. Glass was not only used as a support material, but also for optical appearance. Now it was at last possible to see windows as a sort of art form. It was possible to colour glass brightly or to form it into mosaics. This special form of glass and window styling was especially used in the construction of church windows. In order to be able to produce the largest windows smaller pieces of glass were stuck to each other and the first window bars were invented. While windows with bars were originally used in order to create ever larger windows, today they have many more functions and uses. The windows of today should not also look good as far as appearance is concerned, they should also provide good sound and heat insulation. Additionally they should allow as much light into the room as possible and provide a certain degree of security. Although windows used to serve only one purpose, namely to brighten the room, modern windows can master a variety of different challenges. So, too, the modern barred window. The term real is used here to designate those windows where several smaller panes of glass are brought together to form one window (sash). The individual panes are thus held together by the bars (mullions and transoms) to form one window. This method of assembly is very similar to the original production and is consequently both time-consuming and more expensive. Today the use of bars on windows serves mainly to add an optical element to the window iself. That does not mean, however, that the window loses any of its quality. 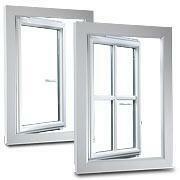 Windows with bars also offer the best possible heat and sound insulation. 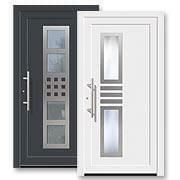 In addition they can be produced in a variety of colours and also be fitted with burglar-proof glass. In Fensterbau today two different styles of window bars are usually offered: real and fake. A more economical option is the fake window bar. This alternative is ideally suitable for those who simply wish to make their window more attractive, as in this variation the bars are merely stuck to the window. Depending on the actual frame the material can be varied. Adhesive-style bars are available in wood, PVC and in metal. In order to achieve the best possible effect one should use Wiener Sprossen or Vienna-style window bars. They are not only stuck onto the outside and the inside panes but a slat is also applied within the gap between the panes. The insertion of this slat gives the window the effect of looking authentic.